You have chosen the double head shower with a 5 1/4 Inch Pancake Showerhead on top. 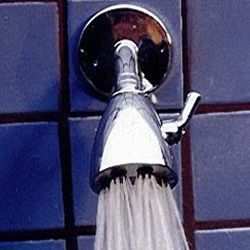 Your second step is to choose a shower head for the bottom portion of your Double Head Shower. Currently, our online shower building application allows you to choose from the following shower heads for the bottom portion of your shower.